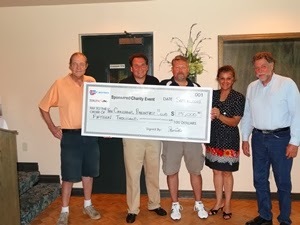 CARQUEST Canada Ltd. held its annual Charity Golf Tournament at Springfield Country Club to raise funds for the CARQUEST / WORLDPAC Charitable Foundation. The Charitable Foundation raises funds that are used for a verity of charities in need in the communities we conduct business. On hand were close to 140 golfers representing our customers, employees and suppliers from both Canada and the United States. On hand from the Children’s Breakfast Club to accept the check was Ted Woloshyn, Zubeda Nanji and Rick Gosling, the founder of the Children’s Breakfast Club.